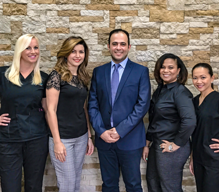 Visit the Cosmetic Dentist in San Antonio for the Holidays! The holiday season is beautiful here in San Antonio — and whether you’re admiring the lights along the Riverwalk or reconnecting with old friends at your favorite happy hour, you want to make sure you’re looking your absolute best. If you are dealing with imperfect teeth, though, it can be hard to smile with full confidence. We have good news. A visit to the cosmetic dentist in San Antonio can help you love your smile, and there is still time to complete your treatment plan in time for the New Year! Porcelain veneers, which hide the appearance of chipped, cracked, stained, or otherwise imperfect front teeth. Veneers are completed over the course of 2 visits to your cosmetic dentist’s office. Teeth whitening, which can brighten teeth by up to 8 shades in a single visit to the dentist’s office. Take-home whitening is also available for patients who wish to reveal their results at a more gradual pace. Six Month Smiles in San Antonio, an accelerated orthodontic system that quickly shifts the teeth that show when you smile. It is more of a cosmetic solution for crooked front teeth than a real orthodontic overhaul. Most adult patients are eligible for cosmetic dentistry. You may need to have a checkup and cleaning first to ensure your teeth and gums are healthy — spots of decay or gum disease should be treated before beginning any elective treatment. Maybe your smile imperfections are more significant than what can be fixed in one or two visits to our office. If so, your dentist can put together a smile makeover — a treatment plan that may make use of any of the above treatments along with restorative services as necessary. The smile makeover does just what it promises, truly remaking your smile to help you feel fully confident flashing that grin! Don’t Wait to Get Started! There is still time to love your smile this holiday season. Our schedule is filling up fast for this month and next, so don’t wait to contact our office to book a visit for high quality cosmetic dentistry. We want to help you smile bright going into 2018! Whether it’s teeth whitening, porcelain veneers, or a comprehensive smile makeover you could benefit from, we can’t wait to show you how beautiful your smile can be. Dr. Racha W. Kadamani is a general and cosmetic dentist providing a full range of services for patients in and around San Antonio, TX. To learn more about her services or to schedule an appointment to begin your holiday smile transformation, you are invited to contact the office at 210-782-6842 or request an appointment online. Comments Off on Visit the Cosmetic Dentist in San Antonio for the Holidays!